The BT Optio 1000SE & OPW1200SE order picking range is designed for medium-level order picking in narrow aisle storage systems. These versatile trucks can be used with aisle guidance systems or as free-ranging trucks. 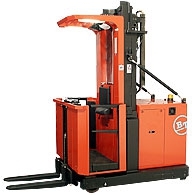 The BT Optio model 1000SE is equipped with an initial lift while the model BT Optio 1200SE is equipped with a walk through solution. Capacities are 1000 & 1200 kg respectively. Both machines are available with a duplex mast enabling picking heights of 6,6 m.